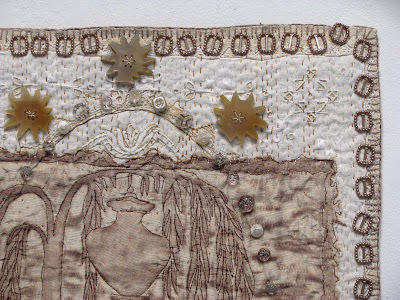 Art In Stitches: Working Like Crazy! I'm behind....pure and simple. With less than two weeks until my husband Steve and I pack up the rental truck and drive Blues Chapel to the Greater Denton Arts Council for my solo show, my "to do" list is incredibly long...and growing no matter how many items are ticked off! I haven't posted about our incredible trip to Oregon...the sand dunes, the rocky coast line, Crater Lake, the Oregon National Caves, and a night in a tree house. I promise; it's coming! In the meantime, I have been working. The one thing that absolutely CANNOT be put onto the "back burner" is time to stitch every day! The only way to submit for juried shows, mount exhibitions, have gallery representation, and live as an "artist" is to continue MAKING MORE WORK. So, even when I can't find time to blog about it, I'm still up to my elbows in creativity. 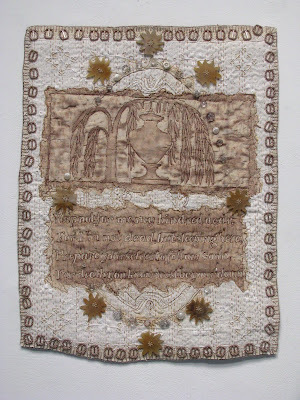 Recently I finished two small additions to the Grave Rubbing Art Quilts Series. The one above includes some of the beautiful, carnival glass like buttons purchased in the Czech Republic and some of the linen thread came from Mickey Smith formerly of Claremont, CA....whose granddaughter inherited her "stash" and passed most of it on to lucky me! 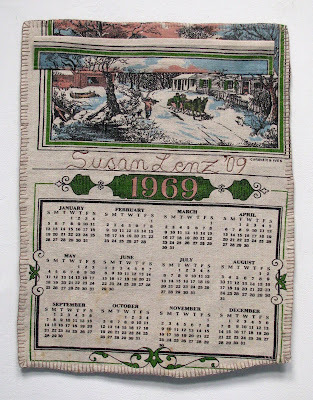 The title was selected from the list complied for an earlier Grave Rubbing Quilt. Lee Monts, a talented painted, suggested it on Facebook. Thank you Lee! 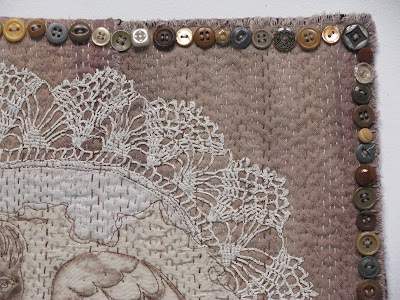 This piece includes several button-like embellishments purchased in Austria. I'm not sure, but the larger ones might actually be bone. They are not alike in size, texture or color. I'm also not sure what, exactly, the ones on the edges were intended to be. They resemble "buckles". If anyone know, please inform me! One of the important things on which I'm putting "finishing touches" is a Power Point presentation about my work, working with a theme, and presentation as a driving creative force. I'm giving it in Denton on Saturday, November 21 at 2 PM. I've already been in contact with a few fiber enthusiasts from the area and am eager to meet them.....and anyone else! Even as the show in Texas grows closer, I'm acutely aware that my show in February at Gallery 80808/Vista Studios is also approaching....and fast! Thus, my Decision Portrait Series is sort of on "hold"....out of necessity....though I've recently transferred three new portraits to tea-stained muslin and am ALWAYS on the lookout for new decision on which to focus. I'll be returning to this work by February at the very latest. 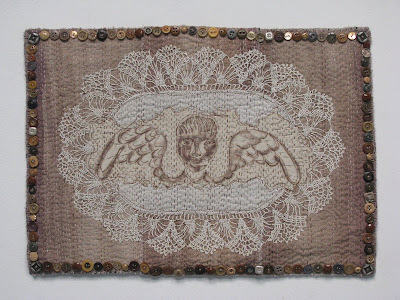 So, now, I'm working every day on the grave rubbing quilts, the installation if hanging epitaphs, the Angels in Mourning Series.....and still collecting artificial flowers from the dumpsters of local cemeteries (NEVER from the graves directly). Thank goodness I have a wonderfully understanding and supportive husband! 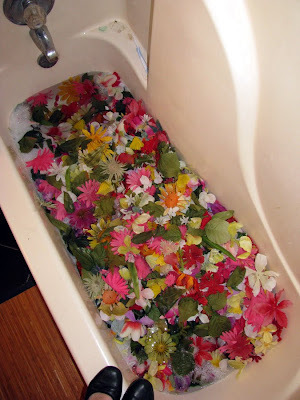 Below is a photo of our guest bathroom earlier today.....you should have seen the mess on the living room floor where I dissected all these blossoms before laundering. 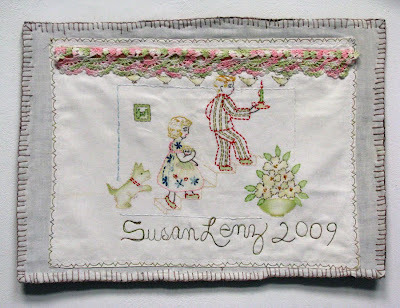 Gorgeous pieces Susan, I love the way you are using the buttons. Good luck with it all, I'm sure you will get there, don't forget to enjoy the process; otherwise why be an artist? love all the hand stitching. And please, do tell ... what are you doing with all those flowers? So glad you saved the title for this piece! It is wonderful. And thank you for the mention and link to my blog! Hope to see you soon. Congratulations on your success! I saw your piece in the Brush Art Gallery and thought it was wonderfully rich in texture and content. I think those little "buckles" are probably used for things like chemise or slip straps, for very delicate things. They look great on your piece.